Just arrived they judge you according to the type of car and caravan. A utility trailer pulling a 2 axle is automatically cataloged in gypsies. Stuck in front of their gate they call the police as an aid. They do not deserve any stars because of their wickedness. 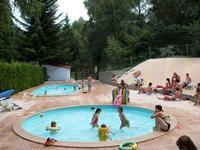 How was your holiday at Camping Le Clos de Balanède?